Our homemade mirror box is such a fun thing to play and explore with. The boys love to watch how materials transform in the box. The mirror box is also a great way to explore simple math concepts like symmetry, shapes, and counting. I recently purchased some colored wooden shapes at the dollar store (Dollarama, for those who want to know). 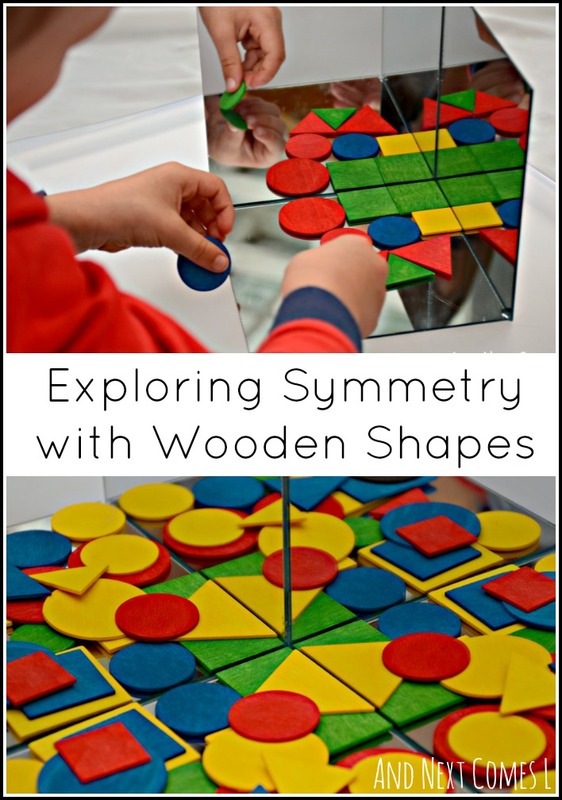 They are so vibrant that I just had to pair them with the mirror box and let the boys explore with this simple math activity for toddlers and preschoolers. The colored wooden shapes take on a life of their own in the mirror box (get the tutorial for it here). J loved to place one shape in the box and then count how many would appear in all the mirrors. Then he would repeat it over and over. K didn't participate too much in the constructing part. He preferred to observe and hand J the occasional shape. You can see his arms as he leans over J. And I guess K also enjoyed emptying the contents of the mirror box each time. Don't the wooden shapes look so fun in the mirror box?